This morning I drove through the New Forest, a national park not far from where I live. It seems that autumn has arrived with a flourish here, the leaves are turning and dancing to the ground and the ferns have changed into golden bracken. The colours all around reminded me of the Gloriana Gold collection, which features little aspen type leaves in greens and golds. 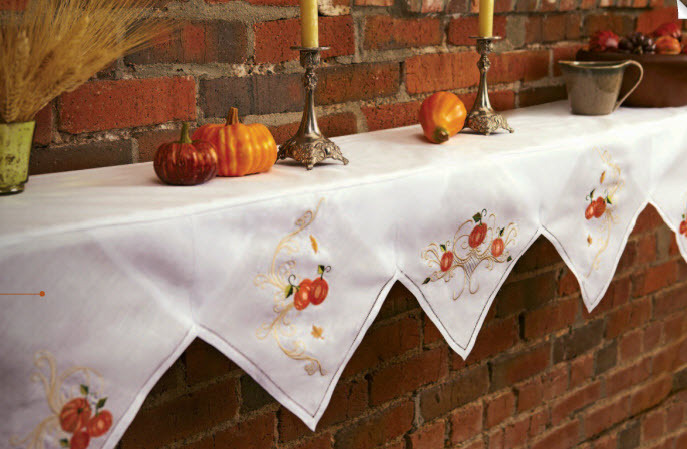 This collection along with Pumpkin Scrolls is perfect for Thanksgiving embroidery. You will be fascinated with the blending of rich colours that are used for the embroidered pumpkins in Pumpkin scrolls. and they can be used for all sorts of projects for around the home. However they would also make a wonderful thank you gift to give, if you are celebrating with friends this year. How quickly the Christmas flurry of excitement and busyness comes upon us. 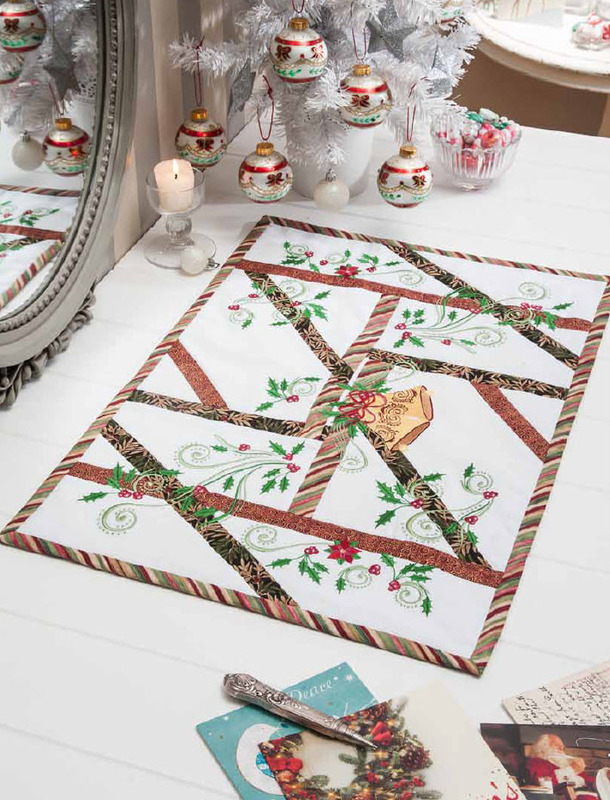 Ideally we should start our Christmas embroidery in January! 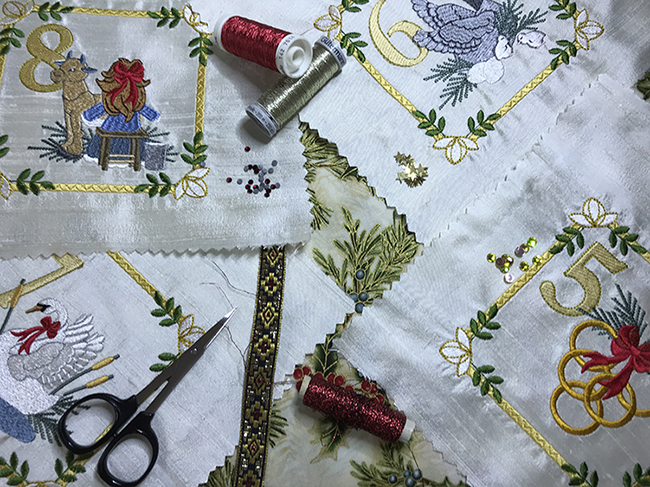 My Christmas collection for this year is still in development so I will show it to you another time, but there are lots of seasonal design collections at Graceful Embroidery. 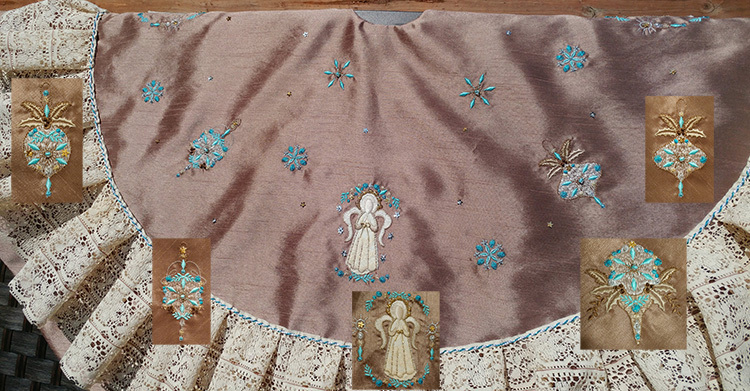 I would like to share some spectacular projects which will inspire you this year to get embroidering. Giving an embroidered gift or card brings so much more joy than a bought one, I feel. Create a 12 days of Christmas wall hanging. 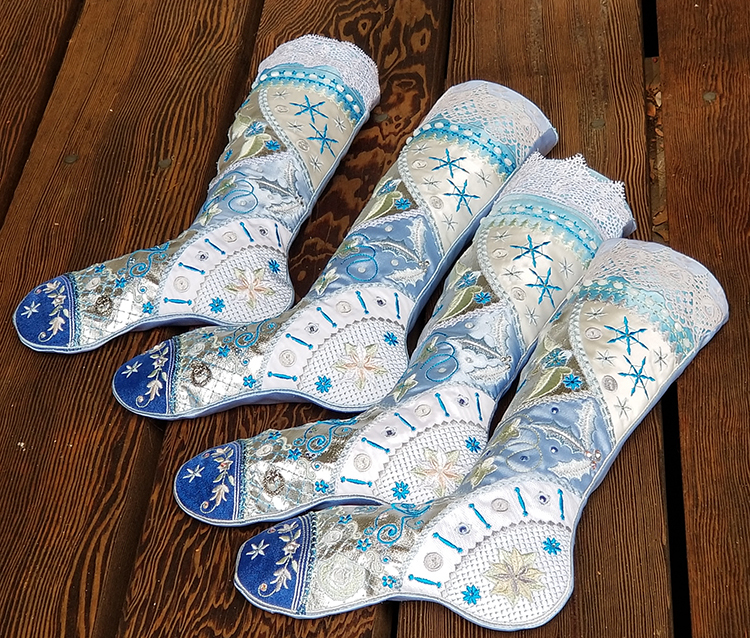 Embroider some crazy quilted stockings. 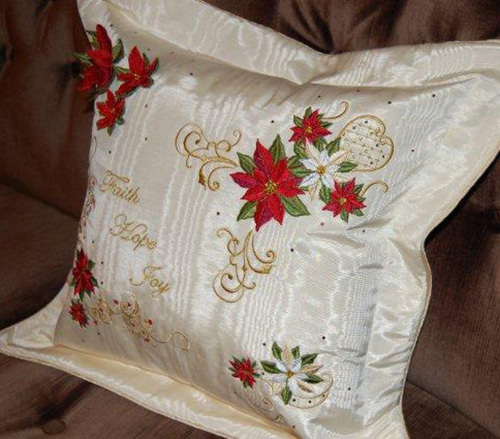 I have created two collections with poinsettias, Poinsettias promises and Stars of Bethlehem. You will find dimensional flowers in the later collection as shown on this cushion. 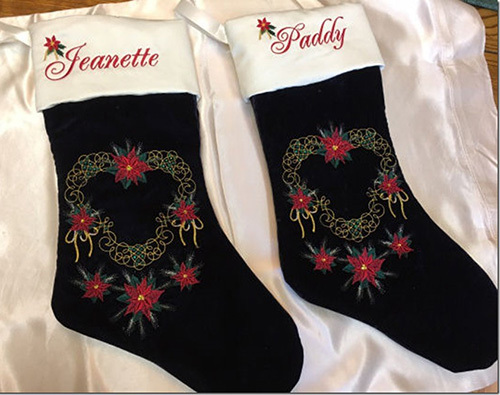 These stockings below were embroidered with Poinsettias promises which has the ornate scroll work very similar to Celtic knot work. Last year I created the Gilded Treasures collection which featured an unusual colour scheme, based on some wrapping paper that I had seen. I had a tree skirt in mind when I digitised these designs. Hopefully you will have got a few ideas on designing and creating your own special Christmas project. 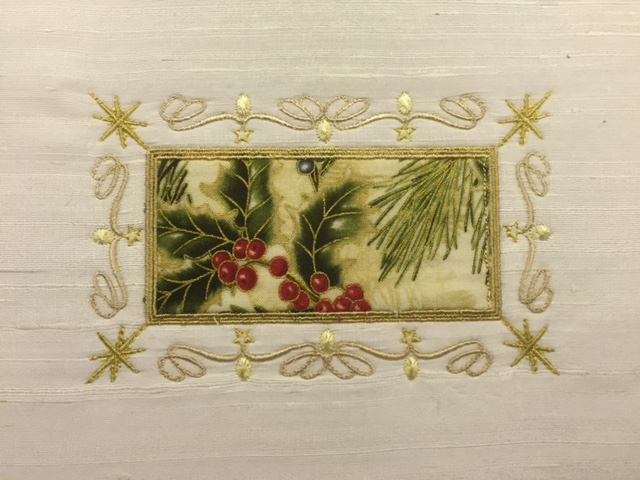 Now is the time to stock up on the Christmas and thanksgiving designs at Graceful Embroidery as my sale has been extended to October 15th. Have fun and enjoy being creative. 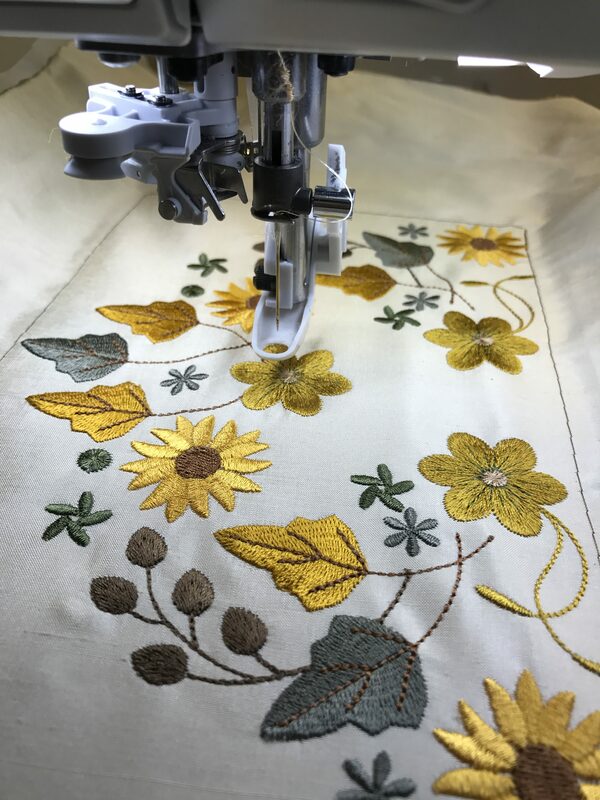 This entry was posted in Discussing machine embroidery, Embroidery projects and tagged 3 Dimensional embroidery, Christmas, Crazy quilting, machine embroidery, The importance of colour. Bookmark the permalink. Thank you for the ideas. These would make lovely gifts.